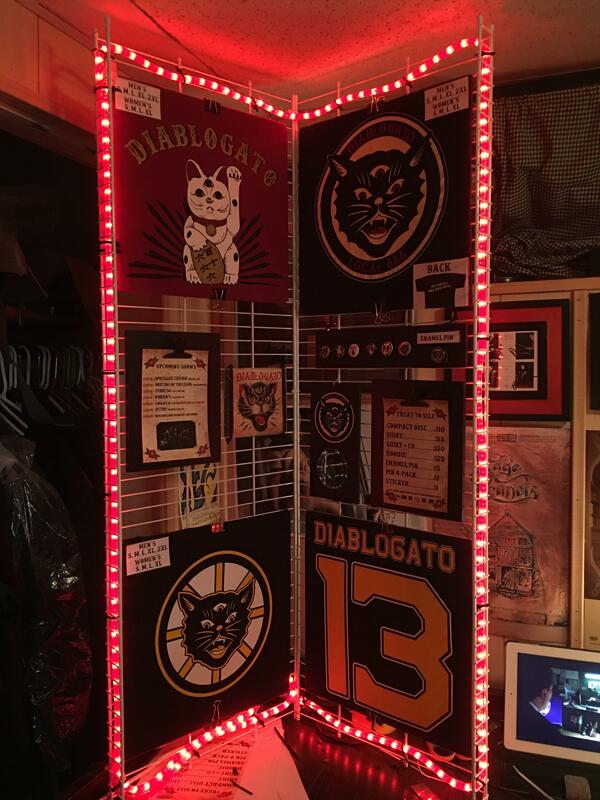 I made a new merch display for my band yesterday. 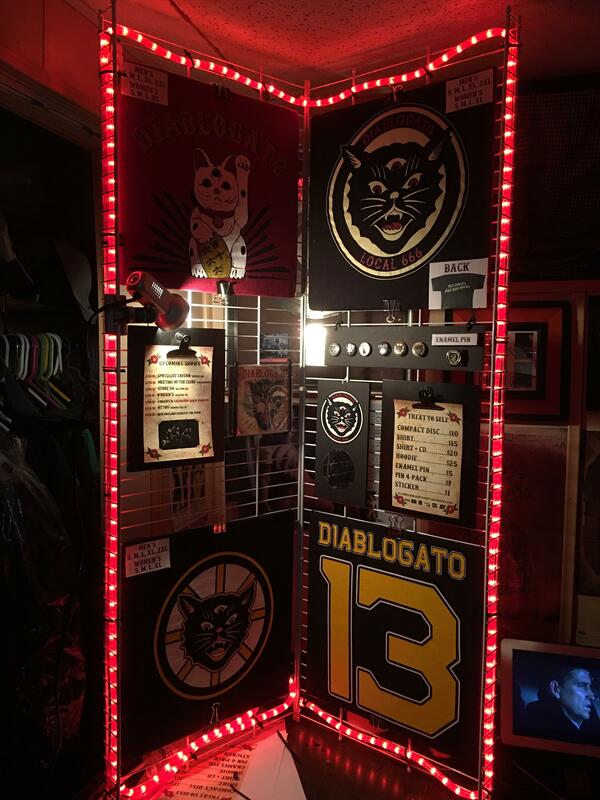 We started out with only one shirt design and free demo CDs and used to carry it all in a little suitcase and display it that way. 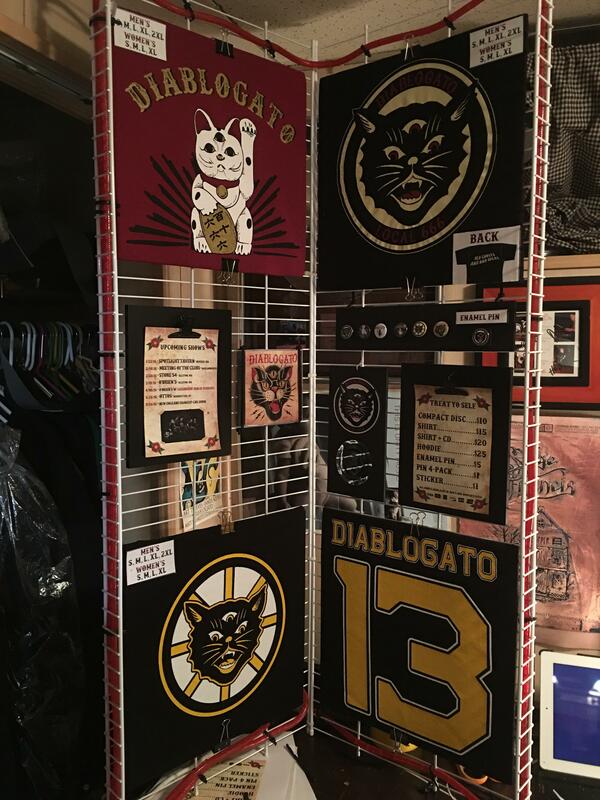 It looked great but now that we have 3 shirt designs, a hoodie, CDs, Stickers, Pins, Enamal Pins, it was getting harder to display everything in an organized clean fashion. So, I built this. Figured it might help people out if they're in a similar predicament. It was super cheap and very easy to do. I took an 8 foot wire shelf and chopped it in half, zip tied it together so it's like a big hinge, and it folds into itself keeping everything inside it protected during transport. I wanted something that would be seen and grab people's attention. I need to get a lower wattage bulb for the spotlight though, it's a little too bright. Nice! Looks easy to transport and set up, as well. Definitely! Just unfold and plug it in! That is so very clever! Very cool. ...and the actual merchandise looks well designed. Well done! This looks great! I like the artwork on your merch too. Slick! As a theater lighting guy, I'd suggest a second flood light. Mount them both on top, one per side, and use a low wattage LED type lamp. 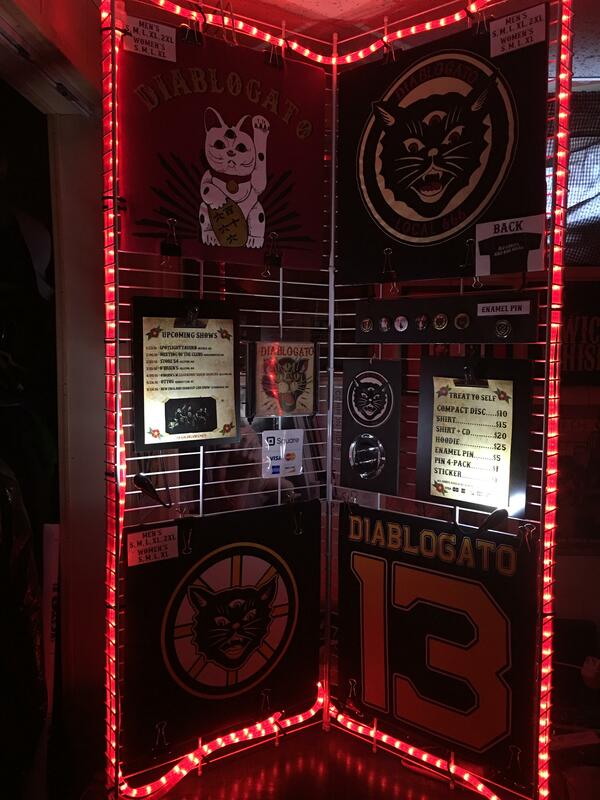 Yeah, I definitely want a dimmer light, mainly just to see the color of the shirts and prices but I also want the red rope light to have effect too. Two white lights might be too much but at lower wattage it might be fine. Only one way to find out! Picked a couple super cheap LED booklights. They have two brightness settings and they can run on built in battery power (about 5 hours) or can be plugged in. These are perfect.